This is a great collection of Shakespeare stories rewritten so that an 8 year old can understand them, let alone an adult. What a wonderful resource to have if you ever want to introduce Shakespeare to a child, but even better to refresh your memory. Reading Shakespeare can be time-consuming, and all the stories have similar plots that after a while you start to confuse them. Having this collection at hand helps as an easy reminder of what every story is about. As for those who have never read Shakespeare, it is a great way to get a summary of what all the stories are about so you can join in conversations (and takes less time than watching the movie would)!All in all, even though they are written for children, I think there is much that adults can benefit from having them. I sure did enjoy reading the collection and it made me want to reread a few of the plays that I had really enjoyed in the past. 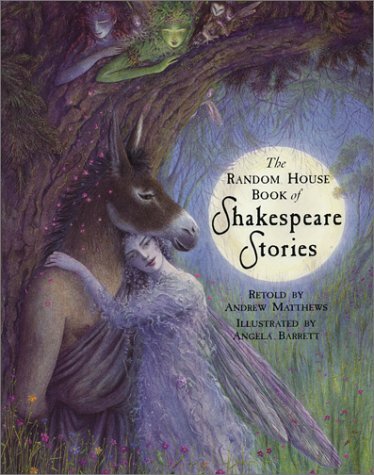 Beautiful illustrations and very accessible retellings of eight of Shakespeare's plays. If a book like this were to be used at grade 4 or 5, I bet a lot of anxiety in students would be decreased and an appreciation for one of the best writers of the English language engendered. Loved the drawings and the summarized (and child-friendly) versions of some of shakespeare's plays. My favs continue to be romeo and juliet, twelfth night and a midsummer night's dream. AndrewMatthews Angela Barrett - Librarian Note: There is more than one author by this name in the Goodreads database.Andrew Matthews was born in South Glamorgan in 1948. Andrew taught English in Hampshire after which he became a full-time writer. He lives in Reading with his wife and their cats. Andrew's work has been widely translated and he has made numerous appearances at schools and libraries throughout the UK.Source: United Agents.